I love busy bags. And I am slightly addicted to making them. One reason that I love busy bags is that they are a great way to keep the boys busy while I teach piano, especially on Thursdays when I don't have any babysitters available to help out. Well, this particular busy bag requires no crafting skills whatsoever and is so easy to put together. Ice cube trays - Mini muffin trays or even egg cartons would work well as a substitute. Fill a container with the pom poms and put the spoon, if you are using one, into the container. Place the ice cube trays beside the container. 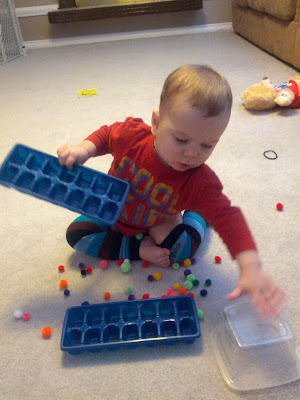 I sometimes even put a pom pom or two into the ice cube tray ahead of time. K is now sorting those pom poms. For older kids, you could have them do color matching activities. 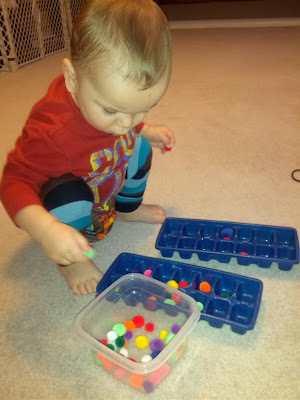 Fill one row of the ice cube tray with one different colored pom pom per slot. Have them match it in the opposite row. Use different sizes of pom poms and have the kids sort them by size. Use tweezers, tongs, or a clothespin, instead of fingers or a spoon, to transfer the pom poms to the ice cube trays. 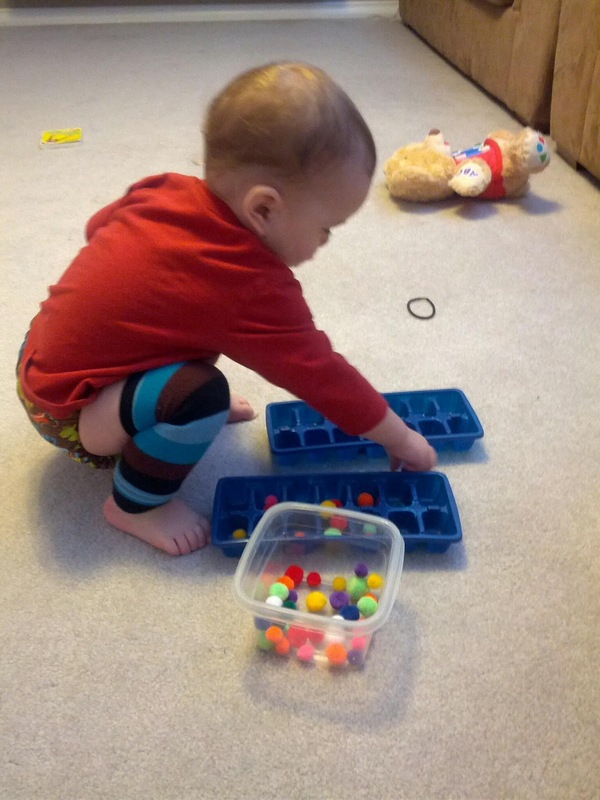 Have your child count the pom poms as they place them into the ice cube tray.